Tourists were invited to join the fun when city officials released 18,000 white seabass. 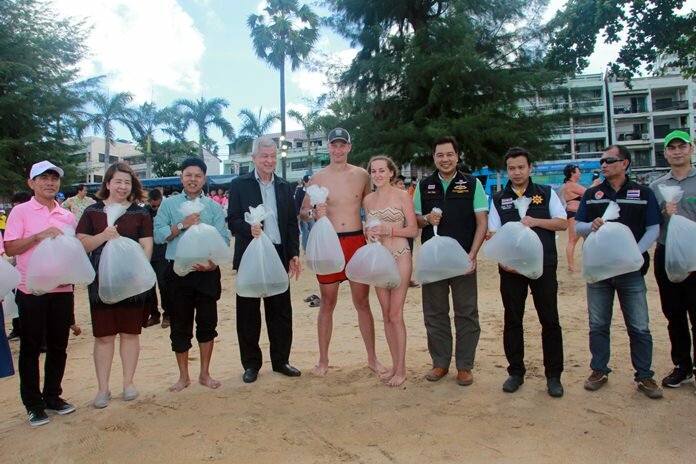 Unable to do much about its trash crisis, Pattaya officials did release fish for World Environment Day. Deputy Mayor Apichart Virapal and Thanet Manoi, director of the Coastal and Sea Resources Management Department, joined 400 students, civil servants and residents on the beach at the Surf Kitchen restaurant in Jomtien Beach June 5 for the release of 18,000 white seabass. White seabass is a popular item on Thai menus, leading to incessant fishing. 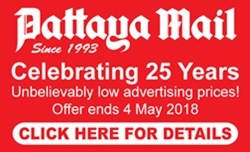 The Environment Day activity can partially restock Pattaya Bay’s depleted supplies. Pattaya also organized beach cleanups and planting of mangrove trees for the day as part of the city’s campaign to raise environmental awareness. 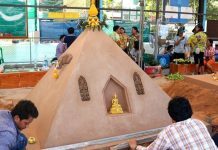 Trash bins were placed along the beach as part of the activities, although Pattaya’s ability to actually empty them remains in question, thanks to an overwhelmed trash hauler and full city dumps.